Because a person’s genetic code can have a large number of mutations with no effect on health, diagnosing genetic conditions can be difficult. Sometimes, genes thought to be related to a particular genetic condition have mutations, but whether these changes are involved in development of the condition has not been determined; these genetic changes are known as variants of unknown significance (VOUS). Sometimes, no mutations are found in suspected disease- related genes, but mutations are found in other genes whose relationship to a particular genetic condition is unknown. It is difficult to know whether these variants are involved in the disease. 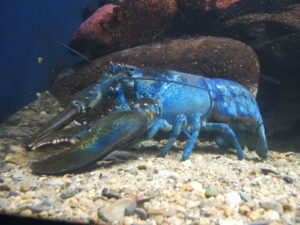 Figure: This lobster contains a mutation that causes it to be blue. This is estimated to occur in roughly one in two million lobsters.